Welcome to spring everyone! We made it through another wild westcoast winter. It’s always exciting to hear the first frog croaking, watch the first hummingbird zoom through the yard, and realise that--yes indeed--spring is here. Now it’s time to peel off that rain gear, and get ready for some warmer, and sunnier days ahead. 2011 More than Just Mud Photo Contest! You can help celebrate the spring arrival of the shorebirds and the marvelous Tofino Mudflats by participating in the 5th Annual “More than Just Mud” contest. This year, the organisers are returning to the origins of the contest and are once again asking you to get out your cameras, visit the mudflats, and capture them in pictures. Cash prizes will be awarded during the Tofino Shorebird Festival. Deadline for submissions is April 30, 2011. Every year from late April through May, flocks of sandpipers, plovers, whimbrels, and many other shorebirds pass through the Tofino area. Thousands stop here to feed and rest as they make their impressive journey from South and Central America northward to their Arctic breeding grounds. The protected forests, expansive mudflats, long sandy beaches, and rocky shorelines of this area create the right combination of habitats to draw over 40 species of shorebirds to the area during their spring migration, including the largest migratory concentrations of Whimbrels anywhere in British Columbia and impressive flocks of Western Sandpipers, Dunlin and more. The threatened Red Knot is also a regular visitor each spring, as well as Rock Sandpiper in winter. In 2010, local bird expert Adrian Dorst listed at least 30 species of shorebirds! Come out to the Tofino Shorebird Festival and marvel at these birds, learn more about them, and learn why Tofino is one of the very best places in western Canada for bird watching. 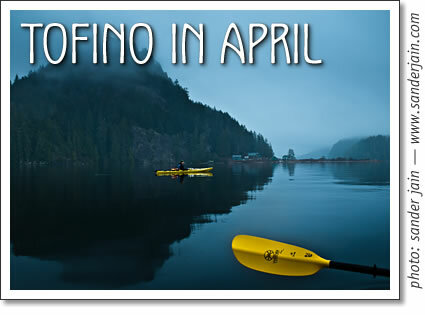 Look for the full spread of events in the May issue of Tofino Time. Tofino Long-Beach Chamber of Commerce, Tofino Parks & Recreation and the Raincoast Education Society are excited to sponsor Tofino’s annual Earth Day Pancake Breakfast hosted in the Village Green Park. Also keep an eye out for other Earth Day related community events! Tofino Parks & Recreation’s annual Easter Egg Hunt will be hosted once again at the Village Green Park. Eggs and goodies will be hidden around the park, bring your friends and family to enjoy the fun! The hunt starts at 10am, no early birds please! There is something for everyone at the Kids’ Rummage Sale! Hosted by the Parent Advisory Committee, this is an opportunity for you to purge some of your old toys and clothes. There will be plenty to pick through, so encourage your friends & family to check out this pac fund raiser! Drop donations off anytime at 1386 Pacific Rim Hwy (house of Sarah & John Platenius) or call for pick: 250.725.3667. Tofino in April 2011: An overview of what's happening this month in Tofino, compiled by Adam Buskard for Tofino Time Magazine.